Himanshu working on a research paper with Professor Nicholas Stern and Montek Singh Ahluwalia on India’s low carbon transition. 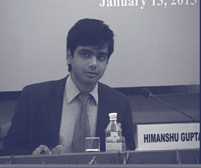 Prior to joining the Grantham Research Institute Himanshu was working with the Planning Commission, Government of India as a project leader on India Energy Security Scenarios-2047 work, which explored energy security options for India by 2047, marking 100 years of India’s independence. Himanshu has authored a chapter in the 12th Five Year Plan of India( 2012-17) on renewable energy, thus becoming one of the youngest to do so. He has been deeply associated with the US Department of Energy and the UK Department of Energy and Climate Change in the capacity of project manager responsible for organizing various multilateral and bilateral dialogues between India, U.S and U.K. He is an Electrical Engineering graduate from Indian Institute of Technology Kharagpur and has worked with the French Nuclear Power Major, Areva, in the past. He will be joining Stanford University for MBA starting fall of 2015.